I am beyond excited for what this means for our ministry as a family. Ever since our wedding, we’ve cramped youth groups and small groups and families visiting into our tiny apartments. We recognize that the Lord provided this house and our desire is that He would be glorified with ministry that will happen within it’s walls. Dios mío bendice mi casa, para que sea un hogar de amor y de la paz. Bendice la puerta abierta como dos brazos extendidos que dan la bienvenida. Bendice las ventanas que dejan entrar el sol cada mañana y por donde se asoman las estrellas que son luces de esperanza. Bendice los muros que nos defienden del viento, del frío y que son nuestros amigos en las horas que pasan. Bendice nuestra mesa y los sitios de trabajo para que nos ayudes y el lugar de reposo para que nos guardes. Bendice el techo que cobija los afanes de hoy y los sueños de mañana y que guarda para siempre entre los vivos la memoria sagrada de los que se han ido. Bendice los sentimientos, las ternuras, los anhelos que florecerán en nuestras vidas. Bendice nuestros pensamientos para que sean puros, las palabras para que sean rectas, nuestros actos para que nos conduzcan hacia Tí. Bendice nuestras horas de paz y de silencio, para que fortalezcamos juntos nuestro espíritu. Bendice nuestros dolores y alegrías porque son el corazón de la familia. Lord, bless our house, that it may be a home full of love and peace. Bless the open door, may it be as two welcoming arms opened wide. Bless the windows that let the sun in each morning and let the stars that are bright with hope peek in. Bless the walls that defend us from the wind, the cold and are our friends in the hours that pass. Bless our table and help us in the places where we work and protect us in the places we rest. Bless the roof that blankets the cares of today and the dreams of tomorrow. That it may always protect the holy memory of the lives that have gone. Bless the feelings, the tenderness, the longings that will flourish in our lives. Bless the thoughts that we have, may they be pure. The words that we use, that they may be correct and that our actions would lead us to You. Bless our hours of peace and silence, that they would strengthen our spirits. Bless our hurts and our joys because they are the heart of the family. The rest was meant to be “happily ever after” (or at least just overwhelming guest lists and cake flavor choices). But alas, for us, and any couple that come from different countries, engagement sets in motion the big questions of WHERE do we live and HOW do we make that possible? Though we met in Mexico and love that country, we knew that starting our life in the United States (and tackling our immigration journey head on) would open up more doors later on in terms of giving us a choice in where we could live. The short-term sacrifices would lead to more long-term opportunities. Most folks are taken aback when they learn that marriage ≠ automatic citizenship. 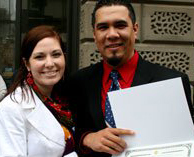 For us, the journey to citizenship lasted nearly six years – from submitting our first application to receiving his naturalization paperwork. Even just typing that one sentence makes it feel like a nice and neat process. Citizenship – 1 year wait (If you became a resident based on marriage, you can apply for citizenship after 3 years of being a permanent resident. So you basically pay for the non-conditional permanent residency and then immediately pay for the citizenship process to begin). *That’s just the total to file the correct paperwork. It does not include any lawyer fees, travel costs to get the in-person interviews, required medical exams, loss of income during “wait times”, etc. So many prayers, tears and cashier’s checks went into the making of this photo! From the moment we submitted our first round of paperwork to the moment Karlos received his US passport, three things have become glaringly clear – we are grateful that mi amor had a “line to wait in”, our current immigration system is broken, and we pray for reform of that system. Throughout this journey, our paths have crossed with some amazing families, each having their own unique immigration story – whether having come to this country this generation or a few back.